As Parks and Recreation Director for Hilton-Parma, Thomas is fortunate to be part of a great team that offers a variety of leisure opportunities through people, parks and programs. Throughout his career, Thomas has built up a library of experiences and knowledge which he eagerly passes on to patrons and fellow professionals. Over the years, Thomas has been recognized at the local, state and national levels in addition to serving as President of the local and state Recreation and Parks Societies. Not only are Parks and Recreation Thomas’ career, but they are his passion. Get to know your Parks and Recreation Director: Thomas loves cooking, playing games and sports, bike riding and enjoying the company of his family, wife, Melissa and dogs, Marty and Bentley! Sheila is a part-time Administrative Assistant for Hilton-Parma Recreation. She has been working for the town since 2002. Sheila is an Alfred State College graduate. She enjoys traveling, word search puzzles, and spending time with her family. Sheila resides in Hilton with h her husband Rob and has one son, Brandon, a daughter-in-law, Christina and two grandchildren, Noah and Julia. Sherry is a Recreation Supervisor for Hilton-Parma Recreation. She runs programs for pre-school, youth and adults and is always willing to take on a new idea or challenge. Sherry also coordinates ski club for Hilton Schools and coordinates the summer camp program, in addition to all department Special Events. Sherry attends and escorts the Senior day trips that occur monthly to various places within New York state for the senior population. Sherry grew up in Hilton and has an Associate’s Degree in Hospitality Management at RIT. She is a current member of the New York State Recreation and Parks Society and is an Associate Park and Recreational Professional and begins her 19th year with the Town of Parma. In her spare time, Sherry enjoys the summer outdoors, golfing, traveling, concerts and spending weekends with family and friends. She resides in Hilton with her husband and her kids, Tyler who graduated from St. John Fisher and Morgan who is attending SUNY Brockport. As a Recreation Supervisor with the town, Ryan is eager to share his knowledge and passion with the residents of the community. He is a graduate of SUNY Brockport and has a degree in Recreation and Leisure Service Management. Prior to working with the Town of Parma, Ryan worked with the Town of Victor and also spent 5 years working with at-risk-youth as a Counselor and Recreation Therapist. He enjoys, camping, hiking, and canoeing in the Adirondacks along with golfing, fishing, cooking, and making his own beer. Jessie is the Senior Program Coordinator and serves nutritious meals through Monroe county Office of the Aging. She schedules our monthly dinners with local caterers & entertainers and also attends local trips with the Seniors. Jessie grew up in Hilton and attended Nazareth College. She has worked for the town 14 years. Married 35 years to Dave and resides in Hilton. She has three sons (Ryan, Trevor & Kevin) and a granddaughter on the way. She enjoys gardening, camping, golf, kayaking and her Jeep. Kathleen is a recreation assistant and oversees the after-school program and recess camps. A graduate of SUNY Brockport, Kathleen interned with Hilton-Parma in 2017 and grew to love this wonderful community. She is passionate about working with different populations and building connections with community members on an individual level. In her free time, Kathleen loves playing softball, cooking/baking, visiting family in Canada, and spending time outdoors. Dustin is a recreation assistant and helps with the senior lunch program, recess programs and youth sports. Dustin is from Endicott, NY and graduated from SUNY Brockport. In his spare time he loves playing ice hockey, attending festivals and trying different foods. During the summer he also enjoys water skiing, biking and his favorite hike is the Eternal Flame Falls in Orchard Park, NY. Dustin is very excited to contribute to this community and is looking forward to having a great experience with everyone. 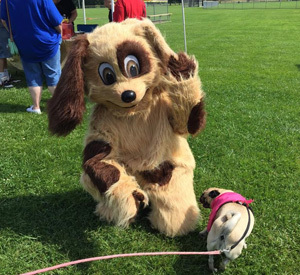 Peanut is the newest addition to the Hilton-Parma Parks and Recreation Department. Peanut was born in June of 2015. Peanut is the life of the party and enjoys dancing, special events, other doggies, treats, pets, high fives, playing with the kiddos and of course, a good walk in the park, dog bone or car ride.